The city uses GIS to combat childhood obesity. 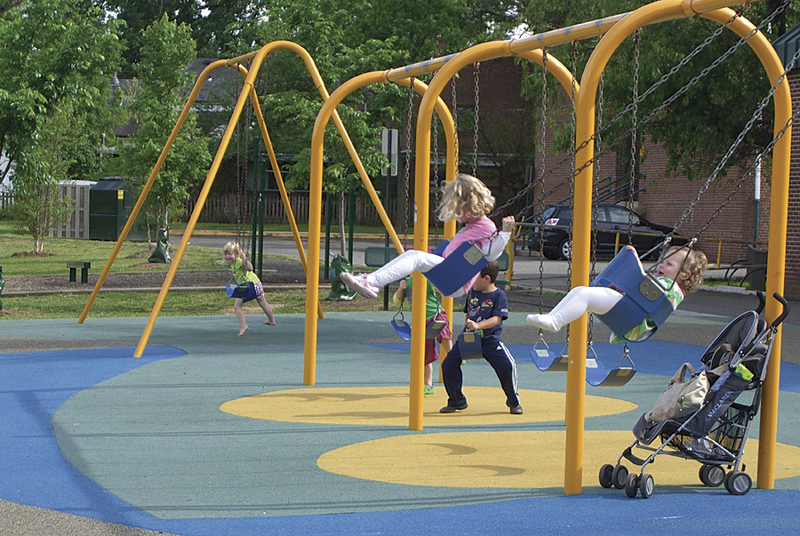 ArcGIS is used to map the locations of play spaces and analyze play throughout the city. 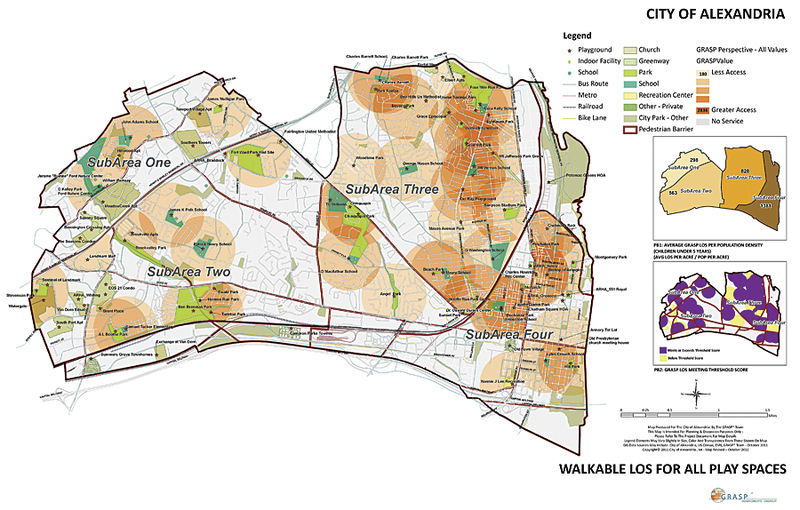 GIS allows planners to decide where play spaces should be improved or added. The United States is experiencing an obesity epidemic. People in Alexandria, Virginia, have decided to do something about it. A 2007 study determined that more than 43 percent of children in the city between the ages of two and five were overweight or obese. Recognizing that getting children active through healthy play is one way to address the problem, several local organizations partnered to obtain a grant from the Kaiser Permanente Healthy Eating Active Living (HEAL) program to conduct a study and improve access to public and semipublic play spaces throughout the city. Team members were the Alexandria Childhood Obesity Action Network, the City of Alexandria, and others. The heat map uses scores for each play space to produce a level of service (LOS) value for any location within the city. In addition, a set of attributes that contribute to making a play space more inviting and comfortable were identified, including such things as ease of access, perceived safety of the location and its surroundings, protection from sun and rain, and the availability of restrooms and drinking water. The scoring was entered into a geodatabase and used to calculate a numerical value for each play space. Play spaces could then be ranked and compared to one another in terms of the value they provide. The study of play in Alexandria will improve access to healthy play and combat childhood obesity. The consulting team has used Esri products for more than 10 years to perform a variety of geospatial analyses of communities related to parks, recreation, and public health. In this case, ArcGIS was used to map the locations of play spaces and analyze play throughout the city. All data management, mapping, and analyses were performed within ArcGIS, without the need to export, import, or join to other applications. Assigning the scores for each play space to a buffer around it yielded a heat map that shows the cumulative value of all play spaces within one-third of a mile of any location in the city. This was assumed to be a walkable distance for children and their caregivers. Significant barriers that might restrict or impede pedestrians were incorporated into the analysis. The resultant map shows a level of service value for access to play spaces for any location in the city. These values range from a low of 0, where no play spaces are within proximity, to a high of 2,836, where multiple facilities with high scores are within one-third of a mile. The heat map was analyzed to determine where a basic threshold of service for play was being provided to children in Alexandria. The threshold used was the score that a single play space would achieve if it scored the median value for each component and modifier. When this threshold is applied to the heat map, it is now possible to determine whether any location in the city has access to a basic level of service for play spaces. Any point on the map where the value is at or above the threshold is shown in purple. Areas where the value is below the threshold but greater than 0 are shown in yellow. All other areas have a score of 0 and are shown in gray. Overlaying this information in ArcGIS with a map of population densities of children in Alexandria allows planners to decide where play spaces should be improved or added. Where areas without service coincide with higher densities of children, new play spaces are needed. Areas where service is available but falls below the threshold may be considered areas of opportunity. Within such areas, there is at least one play space serving that location. By adding components or otherwise upgrading those play spaces, service in these areas can be improved, which will increase their score and bring them above the threshold. Robby Layton, ASLA, CPRP, is a principal at Design Concepts CLA, Inc. His work focuses on the value of the public landscape as an infrastructure that promotes happy and healthy communities. For more information, contact Carrie Fesperman Redden, Alexandria Childhood Obesity Action Network/Partnership for a Healthier Alexandria, or Robby Layton at Design Concepts CLA, Inc. (tel. : 303-664-5301, web: www.dcla.net).